Mutualism is the relationship between two organisms where they both benefit from the relationship. Parasitism is the process where one organism benefits from the relationship while the other is either harmed or killed. Commensalism is the relationship in which one organism benefits off the other without harming the organism. Parasitism and Commensalism are different from Mutualism in the way that in both relationships, one organism benefits and the other doesn't. Yet, they are different from each other as well. Parasitism harms one of the organisms and Commensalism doesn't harm one of the organisms. Mutualism is different from both because in this relationship, both of the organisms benefit from the relationship. All three symbiotic relationships are similar in the sense that in all three relationships, at least one of the organisms benefits from the other. In mutualism, they both benefit off of each other. In parasitism, one benefits off the other while harming the other. And in commensalism, one benefits off the other without harming the other. 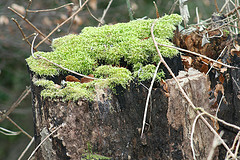 "One example of mutualism in the taiga is moss growing on a tree. This protects the tree, and makes a house for the moss" (biomesfourth.wikispaces.com). The tree acts as a house for the moss while the moss is protecting the tree's body. 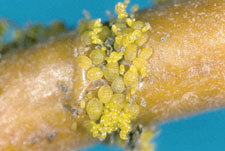 "One example of parasitism is gape vines turning into hosts for the parasite aphid, and, as a result, dies because the aphid infected them" (biomesfourth.wikispaces.com). "One example of commensalism is parasitic fungi and trees. 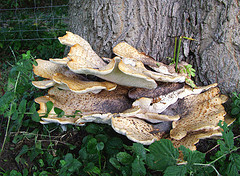 The fungi gets food from the decomposing tree, but the tree is not helped nor hurt because it's dead" (biomesfourth.wikispaces.com). The fungi gets food from the tree, but the tree is not harmed because it is dead.